Unfortunately for “the world’s premier revisionist scholar”, this assertion is false. The existence of a document describing the use of gas vans at Chełmno in explicit detail - the so-called Just memo for Walter Rauff of 5 June 1942 - has long tormented Holocaust deniers, who have consistently dismissed the document as a forgery. In a forthcoming installment of his series refuting ‘Revisionist’ claims about gas vans, Hans will rebut these arguments, which convince no one other than deniers. Mattogno has consoled himself further by claiming that documentation regarding the first extermination camp established by the Third Reich for the purpose of murdering Jews is “almost nonexistent” (Chełmno, p.7). Yet this claim, too, is not really true, because mainstream scholars have unearthed a series of documents regarding Kulmhof (the German name for Chełmno) and the SS-Sonderkommando that operated there. Mattogno just didn’t think to look in books about the context for Chełmno - at studies of the Łódź ghetto  or at studies of the persecution and murder of Jews in the Warthegau, or to spot all the documents about Chełmno cited in the books on the camp. Both collections were used extensively by the leading German historians of the persecution and murder of the Jews of the Łódź ghetto and the Warthegau, Michael Alberti and Peter Klein, in their books published respectively in 2006 and 2009, yet the documents we highlight below were either not cited or were not quoted in full by these scholars. Shmuel Krakowski also cited several documents from the Forschungsstelle A Litzmannstadt file in his book on Chełmno, originally published in Hebrew in 2001, but evidently overlooked the most interesting find we are publishing below. Patrick Montague used neither collection in his 2011 study of Chełmno, but the “new” documents both corroborate his findings and are corroborated by them. Montague’s exhaustive exploration of the very thorough 1945 investigation of Chełmno by the Polish prosecutor Władysław Bednarz enabled him to write the most detailed account of the camp we have so far; a revised edition of his book could easily incorporate these sources. While regular salaries, costs and expenses for SS-Sonderkommando Kulmhof evidently came out of the SS budget, the establishment of Sonderkonto 12 300 allowed the SS to offset at least some costs onto this account. Chloride of lime was in use at Chełmno from January 1942, as the escaped prisoner Shlomo Winer, better known under his pseudonym of ‘Szlamek’, noted in his account of the mass murders at the camp written down in early 1942. It was sprinkled on the mass graves to combat the smell and was also evidently used in trucks and railway waggons as a cleaning agent. The Sonderkonto 12 300 records show repeated and substantial deliveries of chloride of lime, billed to ‘Geheime Staatspolizei Litzmannstadt S’. This was the same annotation to be found on payments to and from Sonderkommando Kulmhof. Many dozens of tons of chloride of lime went to ‘Geheime Staatspolizei Litzmannstadt S’, while invoices show other recipients received chloride of lime for their purposes. The dates of delivery for the iron beams and railway rails – 25 June and 9 July 1942 – may well therefore clarify the start of cremation in pits using grates. The forester Heinz May was an especially early visitor to Chełmno, as he had been ordered to supply firewood to the SS-Sonderkommando. Early, smaller-scale experiments were also more likely to escape the attention of local residents. This was not, however, the case with what was evidently the beginning of large-scale mass cremation. Stanislaw Rubach, a resident of the forest of Kośielec,in between the nearby town Koło and Chełmno, recorded in his diarylike contemporary notes on 11 August 1942 that ‘from mid-July the crematorium was active’. 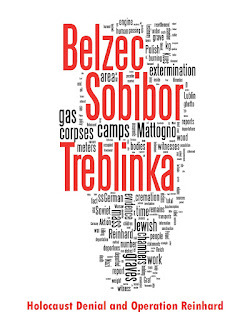 Other witnesses concur on mid-July as the start of mass cremation. .
A start date for mass cremation at Chełmno in mid-July 1942 helps make sense of the well-known enquiry sent on 16 July 1942 from Friedrich Wilhelm Ribbe of the Łódź ghetto administration to the Łódź ‘eldest’ Chaim Rumkowski regarding whether a bone mill, either engine-powered or hand-cranked, could be found inside the Łódź ghetto. Since this document was published by Arthur Eisenbach in 1946 in a collection of documents on the Łódź ghetto and tends to be cited from this edition, Mattogno huffily declared that this source “is recorded only in Eisenbach’s transcript, without even an archival reference. No one has ever seen the original document” (Chełmno, p.80). Yet Mattogno hasn’t exactly gone out of his way to look for the original, which could well be found in the Jewish Historical Institute collection of Gettoverwaltung Litzmannstadt records, as it is not included in the Sonderkonto 12 300 files, and many other sources published in Eisenbach’s document edition are certainly in the Jewish Historical Institute. Unter Bezugnahme auf die Besprechung des SS-Staf. Blobel mit der Firma Schriever u. Co., Hannover, Bürgermeister Finkstr., soll die dort reservierte, bereits in beiseitegestellte Kugelmühle für Substanzen für das KL. Auschwitz zur Lieferung gelangen. With reference to the discussion of SS-Staf. Blobel with the firm Schriever & Co., Hannover, Bürgermeister Finkstr., the reserved ball mill for substances which has already been reserved is to be delivered to the Auschwitz concentration camp. Wir kommen zurück auf Ihr Schreiben vom 7. Dezember v.Js., mit dem Sie uns mitteilten, dass die Kugelmühle der Kommandantur des Konzentrationslager in Auschwitz übersandt wurde. Wie wir nunmehr von dem Kommandeur der Sicherheitspolizei und des SD für den Distrikt Lublin, Lublin, hören, ist die Maschine wieder an Sie zurückgegeben. We return to your letter of 7 December of the previous year, in which you informed us that the ball mill was sent to the commandantura of the concentration camp in Auschwitz. As we now hear from the Commander of the Security Police and SD for the Lublin District, Lublin, the machine has once again been returned to you. Whether or not the compressors returned by the Łódź ghetto administration had in fact been damaged from being used incorrectly at Chełmno – this is only a suggestive possibility – the use of a ball mill at Chełmno to crush bones, and the presence of SS-Standartenführer Paul Blobel, the director of ‘Aktion 1005, at the camp, must both be regarded as historical certainties. Like so many other feeble explanations advanced by “the world’s premier revisionist”, Mattogno’s attempt to explain away the presence of a ball-mill at Chełmno by hypothesising that it was “used to grind down nonflammable materials” (The Extermination Camps of Aktion Reinhard, p.1346) falls foul of the fallacy of possible proof. Just because something might have been the case doesn’t prove it in the slightest, nor does speculation trump eyewitness testimony. The use of the ball mill bought “for the SS-Sonderkommando Kulmhof” to grind bones from the mass cremations of Jewish victims is attested to by multiple eyewitness sources. The use of the ball mill to crush waste materials is attested to by nobody. Ergo, Mattogno’s assertion fails. Following the visit by Höss, Hössler and Dejaco to meet with Blobel and inspect the original pit and grate system of cremation at Chełmno, the camp went over to a new system involving actual crematoria with chimneys. The dating of this change can be supported by a contemporary document – the notes of Stanislaw Rubach, in which he recorded on September 26, 1942 that the crematorium at ‘Ladorudz’ – the section of wood in which the Chełmno ‘forest camp’ was located – “used 60,000 fireclay bricks from Freudenreich”. The firm of Freudenreich was based in Koło; there was therefore no need for the SS to order bricks via the Łódź ghetto administration. And indeed, so far no sign of an invoice for the fireclay bricks can be found in the Sonderkonto 12 300 records. Wie durch NL 7299 vom 25.3.43. bereits berichtet wurde, ist das Lager Kulmhof Post Eichstädt Kreis Warthbrücken, in das hauptsächlich nicht arbeitseinsatzfähige Juden aus dem Warthegau, insbesondere aus dem Litzmannstädter Getto seiner Zeit laufend überführt wurden, zum 1.4.43. aufgelöst worden. Aus zuverlässiger Quelle wurde der Forschungsstelle nun bekannt, dass die dortigen Wachmannschaften der Polizei nachträglich die in einem Wäldchen bei Kulmhof begrabenen Juden wiederexhumieren und diese in eigens gefertigten Öfen verbrennen mussten. – Nach Gewährung eines längeren Erholungsurlaubes wurden diese Schutzmannschaften zum Fronteinsatz abkommandiert. Wie jetzt verlautet, werden diese Kräfte nunmehr wieder herausgezogen, um in Graz für einen gleichartigen Einsatz im Südosten ausgerüstet zu werden. As was already reported in NL 7299 of 25/3/43, the camp Kulmhof, Post Eichstädt, County Warthbrücken, to which mainly Jews unfit for work from the Warthegau, in particular from the Litzmannstadt ghetto, were at that time regularly transferred, was closed on 1/4/43. From a reliable source, the Forschungststelle has now learned that the police guards there later re-exhumed the Jews buried in a little wood near Kulmhof and had to burn them in specially constructed furnaces. After being granted a lengthy leave, these guards were assigned to frontline duty. As is now reported, these forces have as of now been withdrawn in order to be equipped in Graz for a similar deployment in the South-East. Die durch die MzA’s Litzmannstadt Nr. 405 und 406 übermittelten Informationen wurden der Forschungsstelle durch den Angestellten Riehl bekannt, dem sie vertraulich mitgeteilt wurden.Diese Informationen waren Gegenstand einer Rücksprache bei der hiesigen Stapostelle. Die in MzA Nr. 406 gemachten Angaben wurden gesprächsweise durch RR. Dr. Rosse indirekt bestätigt. Von Dr. Rosse wurde noch erwähnt, dass der britische Rundfunk sich mit Kulmhof befasst habe. The information provided by the MzA's Litzmannstadt Nr. 405 and 406 was made known to the Forschungsstelle by the employee Riehl, who was informed of them in confidence.This information has been the subject of consultation with the Stapostelle here. The information contained in MzA no. 406 were indirectly confirmed through conversation by RR. Dr. Rosse. It was noted by Dr. Rosse that the British radio has dealt with Kulmhof. Der Reichsführer SS bittet Sie, die Männer vor ihrem Einsatz noch einmal zusammenzunehmen und sie eindringlich zu verpflichten, unter die Zeit ihres Sonderkommandos einen Strich zu setzen und auch nicht andeutungsweise davon zu reden. The Reichsfuhrer SS asks you to gather the men together again before their deployment and to oblige them insistently to put a line under the period of their Sonderkommando and not to speak of it even in passing. The two memoranda of the Forschungsstelle are just as interesting for what they do not say as for what they do say. The fact that British radio had broadcast news of Chełmno does not prompt the report-writer to make a knee-jerk invocation of the magic words ‘atrocity propaganda’. Instead, the second report confirms the letter from Himmler’s Personal Staff to Kaltenbrunner by emphasising the confidentiality and secrecy of the contents of the first report. Similarly, the first report states that ‘mainly Jews unfit for work” from the Warthegau and Łódź ghetto were “transferred” (überführt) to Chełmno. 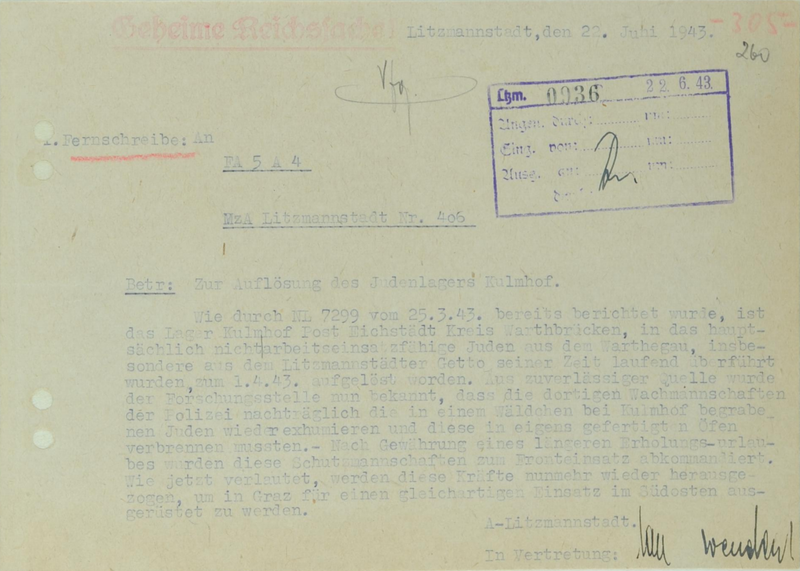 Both memoranda of the Forschungsstelle from 1942 as well as the records of the Łódź ghetto administration at the same time repeatedly identify the deportees as ‘unfit for work’. No mention is made in the Forschungsstelle reports or in the Łódź ghetto administration records of Chełmno as a ‘transit camp’; indeed, during one conversation recorded by the Forschungsstelle between the civil administration and the Łódź Gestapo, it was stated that “the Jews unfit for work will go into the so-called supply camp”, an obvious euphemism that unfortunately for Mattogno and his sidekicks, was apparently located nowhere near the occupied Soviet territories. Much else remains to be presented and discussed from the archival collections we’ve explored regarding Chełmno, the Łódź ghetto and the Warthegau; stay tuned for further blog posts from HC contributors on this subject. For now, think of our old customer Carlo Mattogno and how stupid he looks making yet another ignorant assertion that 'no documents' exist on yet another aspect of the Holocaust. Helene Sinnreich, The supply and distribution of food to the Łódź ghetto: a case study in Nazi Jewish policy, 1939-1945. PhD, Brandeis University, 2004; Andrzej Strzelecki, Deportacja Żydow z getta łódzkiego do KL Auschwitz i ich zagłada. Oswiecim, 2004 (translated to English in 2006); Andrea Löw, Juden im Getto Litzmannstadt: Lebensbedingungen, Selbstwahrnehmung, Verhalten. Göttingen: Wallstein, 2006; Isaiah Trunk, Lodz Ghetto: A History. Bloomington: Indiana University Press, 2007 (Yiddish original: 1962); Sascha Feuchert et al (eds), Die Chronik des Gettos Lodz/Litzmannstadt. Göttingen: Wallstein, 2007, 5 volumes; Gordon J. Horwitz, Ghettostadt: Łódź and the making of a Nazi city. Cambridge, MA. : Belknap Press of Harvard University Press, 2008; Peter Klein, Die ‘Gettoverwaltung Litzmannstadt’ 1940-1944: Eine Dienststelle im Spannungsfeld von Kommunalbürokratie und staatlicher Verfolgungspolitik. Hamburg: Hamburger Edition, 2009. 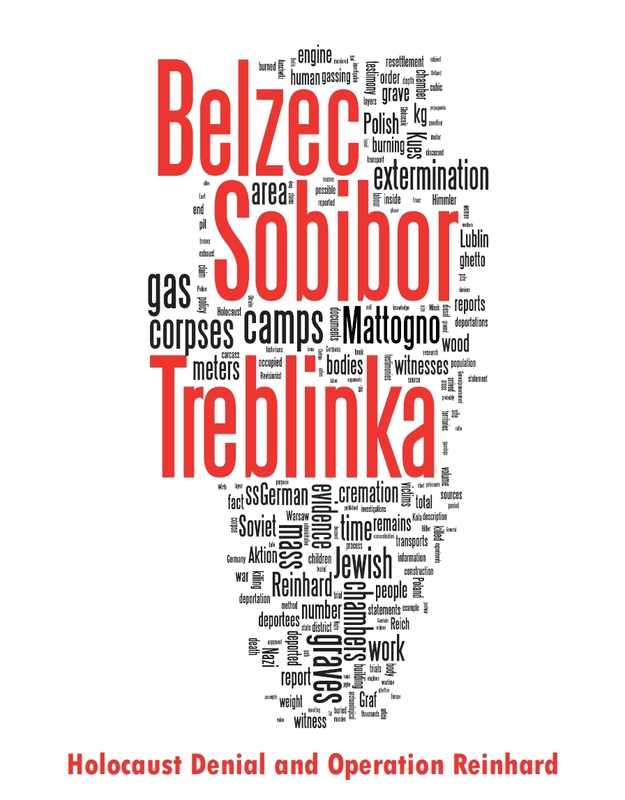 We digitally copied the Sonderkonto 12 300 files from the Łódź archive Gettoverwaltung collection at the United States Holocaust Memorial Museum (where they are held under RG-15.127M) last year; this collection is now substantially uploaded to the Polish digital archive, complementing the previously digitised records of the Łódź ghetto council (Przełożony Starszeństwa Żydów w Getcie Łódzkim) also held at the Łódź state archive. We discovered literally last night, around 1am in the morning that the Gettoverwaltung collection has been put online. This, too, is now digitised and has been uploaded to Yad Vashem’s document collection website under O.51/13, from where it can be downloaded as two PDF files (large files!). Forschungsstelle A Litzmannstadt was an agency under the ultimate control of Hermann Göring. Copies of other reports by Forschungsstelle A Litzmannstadt are evidently filed in the records of the Regierungspräsident Litzmannstadt held in Polish archives, using the same number sequence as is visible from the Yad Vashem-archived file. As the reports indicate, the memoranda were shared with the Łódź Gestapo as well as different parts of the local bureaucracy, depending on the sensitivity of the issues overheard on the phone. Shmuel Ḳraḳowsḳi, Das Todeslager Chełmno/Kulmhof : der Beginn der "Endlösung". Göttingen : Wallstein, 2007, translated as Chełmno: a small village in Europe: the first Nazi extermination camp. Jerusalem: Yad Vashem, 2009 (Hebrew original 2001). Held at Archiwum Instytutu Pamięci Narodowej (hereafter AIPN) GK 165/271; a digital copy of the entire investigation is in our possession. Alberti, Verfolgung und Vernichtung, pp.452-458 and earlier; Klein, Gettoverwaltung, pp.479-506. See Globocnik’s final economic report for Aktion Reinhard in Nuremberg document 4024-PS, and compare with the Katzmann report (L-18). Both regional studies of different districts in the Government-General as well as the work of Ingo Loose make it clear that Globocnik’s figures include cash and valuables plundered by the SSPFs in the districts as well as at the Aktion Reinard camps. Ingo Loose, Kredite für NS-Verbrechen: Die deutschen Kreditinstitute in Polen und die Ausraubung der polnischen und jüdischen Bevölkerung 1939–1945. Munich: Oldenbourg, 2007. Klein, Gettoverwaltung, pp.495-7; cf Der Reichsstatthalter im Warthegau I/13 A.Z. 022/150, Evakuierungsaktion, Überschüsse des Sonderkommandos Kulmhof, 28.4.1942, APŁ 39/221/29665, p.150. On Pabianice see Klein, Gettoverwaltung, pp.489-495. Stadtsparkasse Litzmannstadt, Scheck Nr. 74.428-2, 28.2.1942, APŁ 39/221/29664 unpag. Getto-Verwaltung an die Geheime Staatspolizei Litzmannstadt S, Rechnung No. 010335, 28.5.42, APŁ 221/29666, p.68 – 10,360kg of chloride of lime costing 1,445.20 RM. For an example, see Getto-Verwaltung an die Geheime Staatspolizei Litzmannstadt S, Rechnung No. 010980, 7.7.1942, APŁ 221/29668, p.105 – 1740kg of chloride of lime. Vermerk, Litzmannstadt, den 6. Januar 1942, gez. Krumey, YVA O.53/102, p.235 (= AIPN UWZ/L 205, p.21R). This file is currently not online at Yad Vashem’s digital archive, but was copied by one of the HC team on a recent trip to Yad Vashem. Montague, Chelmno and the Holocaust, p.66. Documents therefore confirm Ismer’s testimony regarding when he arrived at Chełmno, and fit with the time-frame of the liquidation of the ‘Gypsy Camp’ in the Łódź ghetto. Vernehmung Fritz Ismer, 1.8.1961, Berlin, Bundesarchiv (hereafter BArch) B 162/1332, pp. 73-80, here p.75. Getto-Verwaltung an die Geheime Staatspolizei Litzmannstadt S, Rechnung No. 010979, 7.7.1942, APŁ 221/29668, p.106. In addition, 13,000kg of chloride of lime was delivered. Published in transcribed form in Artur Eisenbach (ed), Dokumenty i materialy do dziejow okupacji niemieckiej w Polsce. Bd 3: Getto łodzkie. Warsaw, Łódź, Krakow, 1946, p.279. This document collection is now available online. Transcribed in Eisenbach (ed), Getto łodzkie, p.279. Reisebericht über die Dienstfahrt nach Litzmannstadt, Auschwitz, den 17. September 1942, gez. SS-Ustuf. (F) Dejaco, RGVA 500-1-336, p.69. As hard as it may be for Mattogno or his fluffers to comprehend, we have our own scans of the Zentralbauleitung collection. Dresdner Bank Filiale Hannover an Staatspolizeileitstelle Litzmannstadt z.Hd.v.Herrn Reg.Rat. SS-Sturmbannführer Dr. Bradfisch oder Vertreter im Amt, Betr. : Zession Schriever & Co, Hannover, über RM 7.550,--, 4.2.1943, APŁ 221/2674, p.85. The bank’s letter inadvertently demoted Bradfisch by omitting the ‘Ober’ from Sturmbannführer. Dr. Kiesgo & Co, Bericht ueber den Befund der am 17.12.42 zurueckgelieferten Kompressoren, Koeln, den 8.4.43, APŁ 221/29676, p.162; see also Zusammenstellung der Ablade- und Reparaturstuden fuer 2 Kompressoren, 8.4.43, ibid, p.159, and other correspondence in this part of the file. SS-Standartenführer Blobel, z.Zt. Stapoleitstelle Litzmannstadt, Betr. 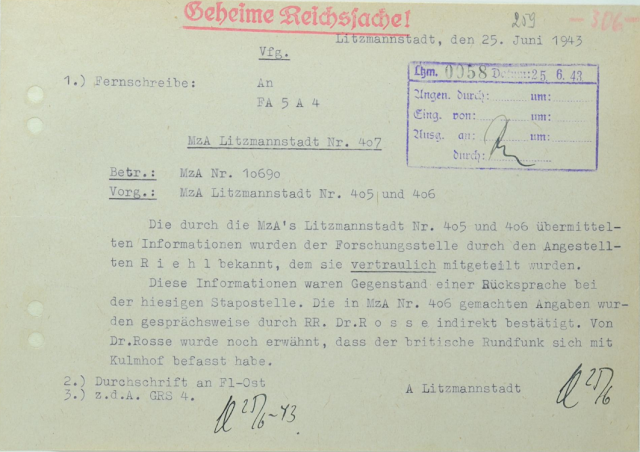 : Lieferung der Firma Motoren-Heyne, Leipzig C 1, Für Zwecke des Sonderkommandos Kulmhof, 3.2.1943, APŁ 221/29674, p.56; cf Alberti, Verfolgung und Vernichtung, p.432 n.332, citing the same document from ZStL, Dok.-Slg. Polen 316, fol.357. Mattogno’s source is a facsimile of the document published in Tatjana Berenstein et al (eds), Faschismus - Getto - Massenmord. Dokumentation über Ausrottung und Widerstand der Juden in Polen während des Zweiten Weltkrieges. Frankfurt am Main, 1961, p.282. Montague, Chełmno and the Holocaust, pp.115-6. Protokół przesłuchania swiadka Stanislaw Rubach, 28.12.1945, introducing and transcribing contemporary diary-note nr 5 of 26.9.1942,AIPN GK 165/271, t.8, p.767: “‘Na krematorium w Ladorudzeu uzyto 60 000 cegly szamotowej od Freudenreicha”. MzA Litzmannstadt Nr. 407, Betr. : MzA Nr. 10690, Vorg. : MzA Litzmannstadt Nr. 405 und 406, 25.6.1943, YVA O.51/13, p.259. MzA Nr. 405 is apparently lost. Now that the original flat assertion has been falsified, we anticipate much moving of goalposts by Mattogno and his fluffers. Der Reichsführer-SS Persönlicher Stab Tgb. Nr. 39/110/43g an SS-Gruppenführer Dr. Kaltenbrunner, 29.3.1943, BArch B 162/601 unpag. For example, Meldung zu Auswertefragen Nr. 244, Betr. : Litzmannstädter Getto, 16.1.1942, YVA O.51/13, p.221: ‘nach der am 16.1. beginnenden Aussiedlung von 10 000 arbeitsunfähigen Juden – es handele sich hierbei um ganze Familien’. Meldung zu Auswertefragen Nr. 284/42, Betr. Getto Litzmannstadt, 22.4.42, YVA O.51/13, p.319: “Die nicht arbeitsfähigen Juden kämen in sogennante Versorgungslager”. > to put a line under the period of their Sonderkommando and not to speak of it even in passing. While most researchers didn't know about this document until now, I'm still justified in pointing at Mattogno and laughing about his utter ignorance and fraudulence in this case. Because his burden of proof is much, much higher than that of the mainstream historians, and if he makes such claims without having examined the necessary documents, well, he only has himself to blame. A historian can make a justified claim about Chelmno without this document, because the evidence is already overwhelming. Mattogno cannot make such a sweeping claim without having examined all the documents. Great stuff, Dr. Terry. Reading about the Holocaust from an accounting perspective, how the German authorities plundered and made use of Jewish property in the Final Solution, was interesting. Thanks a lot. Thanks also for showing Mattogno's ignorance. He's an idiot and a liar, and those who follow him are idiots and liars too. BRoI: "Both the memos of the Forschungsstelle from 1942 -Typo"
No, I wasn't referring to the two facsimiled memos from 1943 but to Forschungsstelle memos from 1942 such as the ones cited in notes 42 and 44 which are from 1942. Have changed the wording to 'Both memoranda' to reduce the confusion. Hardly surprising . It is the same Carlo Mattogno that claims Dr. Mengele's crimes lay on a sole witness - Miklos Nyiszli . When in fact there are hundreds of witnesses , co-workers , some 200 surviving twins ,not to mention thousands that saw him during selections sending people to their death. Maybe this Mengele article by Mattogno and his asserted collection of lies can be demolished here as well ? "We need only inquire, however, for whom this alleged propaganda was intended, since not even the delegate from the Red Cross who visited Auschwitz in September 1944 was permitted to visit Birkenau Camp.5"
He never stops to think: why. blog contributors work to their own pace, so we cannot promise when we might look at something, and cannot therefore "take requests". However, regarding Nyiszli, a translation of a Mattogno booklet on Nyiszli was due to be published in May 2016, it's now overdue, but presumably will appear at some point. There will be more interest in looking at Nyiszli-related things when that's in English. Mattogno published a booklet of 108pp in the 1980s in Italian about Nyiszli, so we presume this is what will be translated, maybe with the Inconvenient History article thrown in, who knows. It sounds like you've debunked Mattogno's Mengele article in your own mind by comparing info from other sources with the denier claims. I have not actually had to work hard at debunking Mattogno's Mengele article.
" The essential and sole witness, the one upon whose testimony the whole accusation is based, was an extraordinarily creative impostor. " And you know for a fact that their are actually hundreds of witnesses to Mengelle's experiments and thousands that saw him during selections - it just screams to the sky that this above statement is a blunt lie meant to mislead people. That putting aside the testimony of Miklós Nyiszli, which i do not doubt and is a most discriminating first hand testimony , since Nyiszli worked at Crematorium II and gives precise evidence of the horrors that took place their as well as Mengelle's experiments. It is clear why denialists would try to discredit him as his detailed testimony shatters their story completely. One should be very careful about those "thousands" of witnesses because it was a "default assumption" in the camp that it was Mengele who was always at the ramp, so many witnesses just assumed that they saw the infernal doctor (see e.g. Dragon's mistake on this very point). As Dr. Lipstadt points out, "Lots of survivors who arrived at Auschwitz will tell you they were examined by [Dr Josef] Mengele. Then you ask them the date of their arrival, and you say, 'Mengele wasn't in Auschwitz at that point'." That such statements are in the thousands doesn't make the problem go away because of the persistence of the Mengele meme in the camp. It is therefore important to examine specifically the testimonies of the SS personnel, of the other doctors, etc. - the people who had to know. They of course confirm that Mengele took part in the selections, albeit they don't number in the thousands. As for Nyiszli, he's a witness in a need of defense himself, so to say. I'm sure you know his book contains weird exaggerations, including many wrong descriptions of the crematoria (four elevators, 200 m long gas chambers...). We know, for example, that Dr. Lettich belonged to the Sonderkommando but never really visited the gas chambers because he was forced to stay in his Block, and his descriptions, although valuable, are second-hand (this also explains some inaccuracies, like him repeating the "soap and towels" meme). I wonder if something like that was also true for Dr. Nyiszli. His later book employed some "poetic license". His "poetic license" of 1946 should be as relevant for judging his worth as a witness as his slightly earlier testimony, especially as the concept of poetic license doesn't apply to memoirs which were expressly claimed by the author to contain only the truth "free from all passion, without the slightest exaggeration". Basically, the point is this: Nyszli's testimony cannot be fully dismissed (as deniers would want it), but neither is it sufficient by itself. If Nyiszli claims that A killed B, sorry, but this is in doubt, considering Nyiszli's provable exaggerations. *However* were some other independent source to appear that claims roughly the same thing about the same event, the convergence of evidence would kick into place - although not sufficiently credible by itself, Nyiszli's earlier testimony could be used to buttress this latter piece of new evidence. Sergey, the basic point is that one examines all the evidence together for everything. Tadeusz Borowski wrote a novel after the war regarding his time at Auschwitz, this is explicitly labelled as such, yet it contains details that are certainly historical, because we see them in other sources. Conversely, one finds memoirs with clearly fictionalised elements that are not plausible, along with outright lying and dissembling in some statements by SS men. We have novels, literary memoirs (which is how one should classify Nyiszli), autobiographies, reports written after the war published as 'memoirs' later on, affidavits, cross-examinations, interrogations, statements, contemporary accounts plus letters smuggled out and manuscripts left on-site. They were all produced by eyewitnesses but they are verging on different genres of testimony. The statement by Nyiszli mentioned by Hans from 29 July 1945 is the product of a hidden dialogue as this was a DEGOB questionnaire-generated statement. Not the same type of source as a memoir intended for publication. Premature Mengele-sightings can be found in many of the above categories of testimony, many from before he was truly 'famous' in later decades, so they seem much more like a case of mistaken identity than simply projecting him back onto the selection at arrival. Mengele is also described in bizarre ways that make more sense if some prisoners were mistaking him for someone else. > Sergey, the basic point is that one examines all the evidence together for everything. That was my assumption all along. > Not the same type of source as a memoir intended for publication. Not the same, but not divorceable from a slightly later "truthful" memoir either. We examine everything together, remember? Publishing such a memoir tells us something about the author. Hence the slightly earlier testimony is inevitably tainted by the exaggerations of a memoir presented as an unexaggerated truth. Nyiszli describes in his book how the Bunker 2 site was used for mass shootings near the pit. Mattogno et al. claim of course that this contradicts other witnesses, etc. etc. However in NO-2310 Deszö Schwarz describes how one of the five Birkenau "crematoria" - the one without the ovens but with a giant pit (an obvious description of Bunker 2) was used for shooting (lustiges Preisschießen) of small transports (up to 100 persons) near the incineration pit under the direction of Oberscharführer Moll, during which 15 of DS' comrades perished. There are some contradictions between accounts (e.g. Nyiszli claims the method was used for groups as large as 5000 - but, of course, we know he's an exaggerator), but the core rings true, so on the basis of these two flawed (albeit not *equally* flawed) sources we can make a probability judgment: some groups of people probably were victims of mass shootings in the Bunker 2 area. "Not the same, but not divorceable from a slightly later "truthful" memoir either. We examine everything together, remember? Publishing such a memoir tells us something about the author. Hence the slightly earlier testimony is inevitably tainted by the exaggerations of a memoir presented as an unexaggerated truth." But we're talking about a memoir that has literary embellishments as well as accurate reportage. One has to distinguish between the two in the first place, inside the memoir. The taints may have no equivalent, point for point, in the earlier account; and they may depend on specific types of perceptual recall such as distances, dates, people. If there are earlier point-matches then these can establish the embellishment and help excise the problem parts. Ultimately, the act of outright lying is quite different to the act of fictionalising, and both are different to the act of misremembering or misperceiving in the first place. All can be potential problems, but they're all things that can be detected and accounted for, yes, even lying (I'm thinking here of perpetrator lies in their own defense that are mixed in with corroborated truth). A lot of Nyiszli's memoir is very usable, in conjunction with other sources, as well as his earlier testimony. It is also usable on truly intimate personal details that only he could know, in exactly the same way as any other testimony is usable on sole-witness details - the fact that it's sole-witness carries its own caveat emptor to begin with. But those aren't the details that bother deniers. As you point out, being a sole witness is an issue in itself, but being a sole witness with a skewed concept of truth (which N. made clear with his statement about his book) doesn't help things. Which is why "Nyiszli says it, so it's probably true" is a much more problematic statement than, say, "Langbein says it, so it's probably true", even if both of them boil down to probabilities (then again, what doesn't?). As I've made clear above, I'm not dismissing Nyiszli, but neither should his claims be used without further corroboration, albeit they can work nicely along other evidence. In this respect he is not unlike Gerstein, whose testimony can work nicely in tandem with Pfannenstiel (even when P. accuses him of lying, etc. ), but whose juicier and less corroborated parts have been uncritically used by historians like Arad. Um, missing the point slightly. A sole-witness personal detail should generally be identified as coming from the sole witness, e.g. someone reports on a conversation they had with someone else. Maybe there's a pattern of such conversations, but each is ultimately sourced by one witness. This is actually quite normal because why would there be multiple witnesses to such things. I don't think you can or should devise rules to 'silence' witnesses in such situations. But it's good practice to make clear that the personal detail is exactly that, and there's only one source. Otherwise historians working on far worse-sourced eras would be hamstrung rather badly. Some medievalists work with what might as well be the equivalent of Zisblatt as their sole source, someone's synthesis of a popular tale they've effectively stolen from someone else many decades after the fact, and that's all they've got. We can easily forget how lucky we are to have so many sources on this subject. Yes, one should point out that there is a single source, but one should also assess the source's credibility in specific areas of inquiry. If we know that the source is credible on the big picture (Nyiszli is) but not on the known details, or that the source had no compunction in saying something is truth when they knew it wasn't, then one should be suspicious of non-refuted but uncorroborated details which this sole witness provides. If on the other hand the witness is also generally credible on the details, using them is much less of a problem. To continue the Gerstein analogy: when using Gerstein, Arad points out that this or that claim is based on Gerstein's report. So far so good. It is my opinion however that he fails at the second step, namely, in assessing Gerstein's credibility about details. One claim in particular is on p. 102 of BST, namely, that Gerstein's rendition of Globocnik's speech is reliable (even if Globocnik's claims themselves weren't). Considering the other claims Gerstein makes in his report I think it is a folly to claim without corroboration that Gerstein's retelling of what Globocnik allegedly said is reliable. It is not a "fact", even with caveat emptors. On p. 103 Arad blames Globus for inventing the outrageous details, but it's just as probable that those were Gerstein's errors (whether one then classifies them as lies, mistakes, inventions or false memories is another issue). On p. 171 Arad takes Gerstein's claim about Globus' alleged desire to bury bronze tablets in the mass graves at face value (properly specifying the source and all) - even though without further corroboration it does not rise to the level of a probable fact. Maybe Globus did, maybe he didn't - we don't know. Why? Because while while Gerstein correctly paints the big picture, he lacks credibility when it comes to specific details. So when I see something like "I don't doubt Nyiszli", I will always point out that this is exactly the wrong approach. You don't dismiss, but you certainly doubt. PS: yes, medieval and ancient historians are a bit "fucked" in this sense, but then I think they themselves would point out that their reconstructions are inherently less detailed and more tentative than modern history. Another striking example would be Adolf Rögner. A very, very knowledgeable inmate with near-zero credibility. Yet not useless, as Joachim Neander's first gassing article shows. And it would still be a folly to use the numerous (really, numerous) details of his voluminous letters and other statements without corroboration. Simply because he was shown to be a particularly unreliable fellow. But once there is corroboration (like the Bunkerbuch), it does wonders. "PS: yes, medieval and ancient historians are a bit "fucked" in this sense, but then I think they themselves would point out that their reconstructions are inherently less detailed and more tentative than modern history." Yes and no. They are more text-centric because the texts are more or less all they have, so they have to work with them, or they're stuck. But every era of history has been influenced to some extent by literary approaches and the acknowledgement of genres; basically if you work on a particular moment in time, you have a certain quantum of texts to work with, and they will all be 'biased' and 'unreliable' for a variety of reasons. Autobiographies and memoirs fit into certain literary genres and traditions, and may well reflect the influence of prevalent traditions (Bildungrsoman, travelogue) in some cases. But 'literary' influences are an inevitable result of texts being produced en masse by a literate population. I was discussing this issue with a colleague teaching a course on African-American history, who will be discussing slave narratives; he mentioned an example of a pre-abolition slave narrative from a fugitive who went north, describing being whipped in punishment. The number of blows? 300. That would almost certainly be fatal; the number is surely an exaggeration. There are far fewer slave narratives extant than there are accounts of WWI/WWII, the Holocaust or Vietnam, and by 'objective' standards they are probably more tainted. But they're all we've got, so you work with them; that includes dealing with the outright fakes (eg Vietnam veterans who weren't), using fiction (very common with WWI and Vietnam), and sifting through the peculiarities of memoirs. The upside with the Holocaust is we've still not digested *all* the accounts by a long shot, and there are an enormous number that are stunningly detailed, not written with excessive poetic license, and often highly sober and objective despite the horrific conditions they describe. And those are the ones written down in the 1940s. The letter's date is 3.2.1943, as correctly mentioned in the respective footnote.